Sorry for the silence over the last several days. I’ve really had a tough couple of weeks. I mean, seriously you guys, Murphy’s law in full effect. I haven’t been sleeping well because a particularly bold family of raccoons decided to make my roof their home. I called wildlife control and they set up traps that work great, only problem is they’ve been catching my neighbors’ cats. If that wasn’t enough, I hammered all hell out of my thumb instead of my intended target, a nail. My subsequent crying made my allergy symptoms that much more unbearable, ushering in one of the worst sinus/tension headaches I’ve ever had. Meh, I could go on, but you get the idea. Anyway, I’ve been making the best of things around here. Since I’m not sleeping very much, I have a ton of time to clean up and organize my house. I might fill you in on more of those deets in a later post. But first, I thought I should share a little bit about my current food situation. Usually when things are not going the way I had planned, I turn to comfort food. Mostly sweets. Lots and lots of sweets. Fortunately for me, this year’s farm share and farmer’s markets are having none of that sweet tooth nonsense. Everywhere I turn there are some pretty amazing looking salad greens. I’m not too discerning when it comes to salad greens. I do notice that some greens are more bitter than others, but honestly salad dressing is what makes or breaks a salad. If the dressing is delicious the salad is transcendent. Long story short, my current obsession is homemade salad dressing. A couple of things to note: 1. Since I’ve been making my salad dressing, the half used bottles of store bought salad dressing that crowded my refrigerator doors have become nonexistent. Making your own salad dressing means that you can quickly make just enough, and you will never have to smell the old bottles of dressing in your fridge all the while praying that it’s actually still edible. 2. 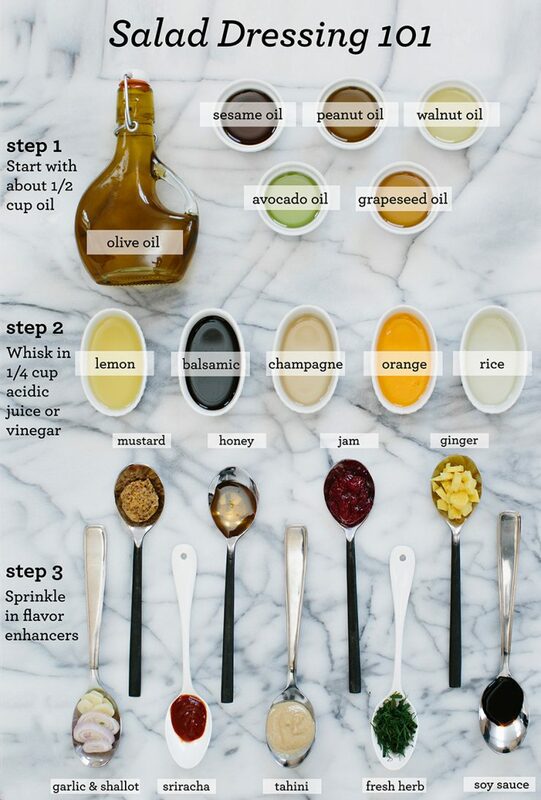 Homemade salad dressing is so easy to make and so insanely easy to customize that you’ll never look back. I promise. You must try this! 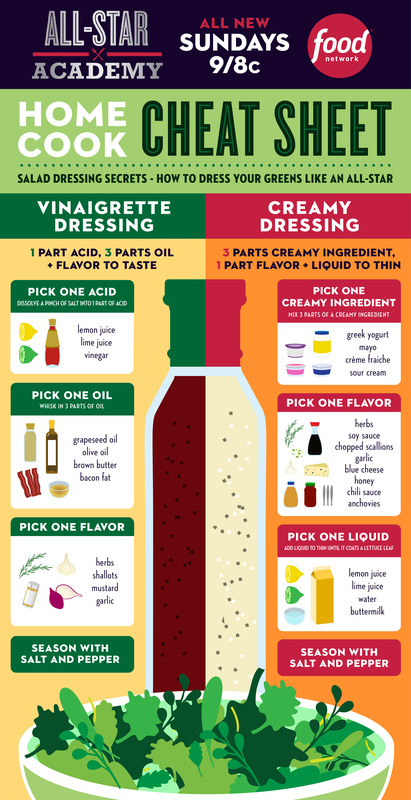 Here are some simple infographics that will make all of your salad dressing dreams come true!